As a physician led organization, allowing our clinicians to have real impact with their patients is our main priority. As the healthcare landscape becomes more complex and competitive, providing the professional administrative support to allow an efficient, rewarding, and safe personal practice is what we do. We understand you want a comfortable work-life balance and to be supported and challenged by the most excellent partners. Alteon Health partners with hospitals to deliver the highest quality patient care. We empower our physicians and staff to employ innovative and adaptable care-delivery models. We foster the growth of our team members through mentorship, education and professional development. People are at the center of everything we do. We view our patients, colleagues and partners as family. We value our hospital partnerships and are invested in the communities they serve. We believe in providing resources, mentorship and support to empower those dedicated to our mission to help them realize their career aspirations. An affiliated member of Prime Healthcare Services, Saint Mary's Regional Medical Center is a 380-bed acute care and general medical/surgical hospital. A nationally accredited Center for Cancer and a full-service Heart and Vascular Institute, Saint Mary's Regional Medical Center was named as the state's first Nationally Accredited Breast Cancer Center of Excellence and is the only hospital offering CyberKnife, a non-invasive radiation delivery system, in Northern Nevada. Nestled along the western border of Nevada near the looming Sierra Nevada Mountain range, the Reno area has something for everyone. From the arts to the cultural splendor, from the casinos to its unprecedented natural surroundings, this city is rich in both tradition and and fresh entertainment. With natural beauty, charm, history and western hospitality. The Northern Nevada area is home to over 40 individual golf courses. Among its golf courses are the Divine Nine, a group of top-rated area courses designed by pros such as Arnold Palmer, Johnny Miller and John Harbottle and set amid the magnificent Sierra Mountains. Additionally the area boasts 18 world-class ski resorts, including Squaw Valley - home of the 1960 Winter Olympics. The Northern Nevada area boasts 60 gaming locations, the historic boomtown of Virginia City, world-class fishing, hiking, biking and numerous other outdoor activities. 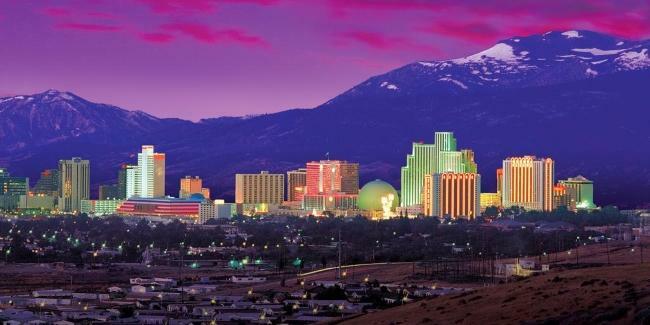 And above all, Reno is just minutes from the world-famous Lake Tahoe.